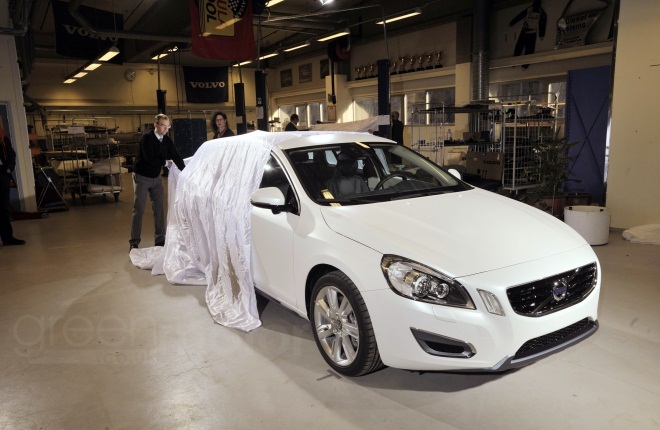 At the Geneva motor show next month, Volvo will unveil a pair of V60 Plug-in Hybrid show cars. They will be beautifully finished in satin white paint with slate-blue highlights, and will boast a blue and blonde leather interior with contrasting white stitching. I was lucky enough to view both show cars a month early, as they sat in Volvo’s Gothenburg race-car workshop waiting for their final bits and pieces to be glued, screwed and hammered into place. 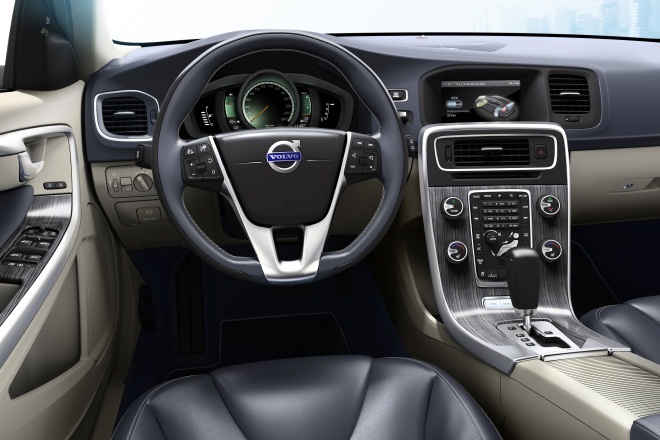 Volvo has chosen a surprising starting point for its first plug-in hybrid car, due to go on sale at the end of 2012. Aiming for reduced emissions, the Swedish company has rooted through its parts bin and plucked out not the smallest and leanest engine it could find but its biggest and beefiest, a 2400cc five-cylinder diesel capable of churning out 202bhp (151kW) and 310lb ft (420Nm). Volvo’s engineers have slotted this D5 engine into the nose of a V60 estate. Drive is sent to the front wheels via a 6-speed auto box. So far so normal, but moving to the rear, a 12kWh, 400V lithium-ion battery has been bolted under a raised boot floor. 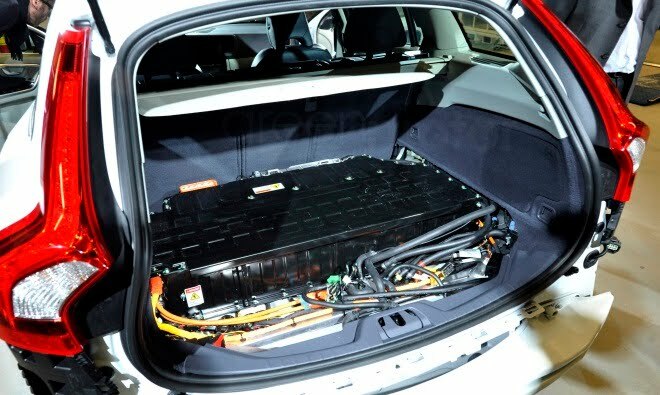 This is quite a substantial pack – the battery in a Nissan Leaf, which has no diesel engine to fall back on, has only twice the capacity at 24kWh. The V60’s battery gets its energetic electrons in three ways: directly from the mains when plugged in; from a 7kW generator/starter motor driven by the engine; or via regenerative braking. This stored energy can then flow down to a 50kW (70bhp) motor, capable of adding up to 200Nm (150lb ft) of twist action to the back axle. The V60 hybrid will thus be a 4x4, with power available at each of its four paws, albeit two different types of power front and rear. 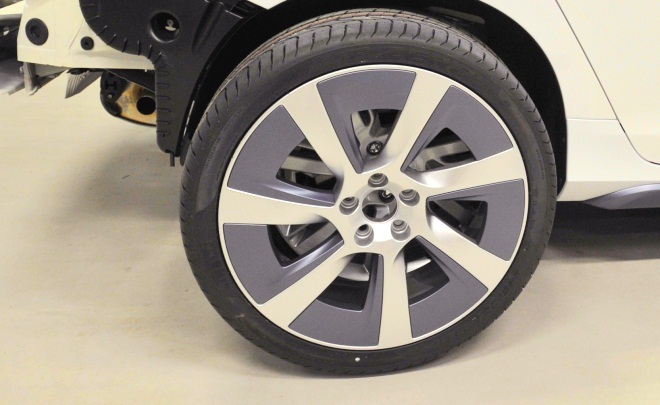 This configuration is sometimes called a “through-the-road” hybrid, because the only mechanical link between the diesel engine driving the front and the electric motor driving the rear is via the tarmac under the tyres. As well as being a hybrid 4x4, the car will also run solely as a front-wheel-drive diesel car, or as a rear-wheel-drive electric car. A hybrid has the potential to be smoother and more seamless than any ordinary car, because the electric motor can step in to deliver continuous power during those instants when the gearbox is occupied swapping gears. Getting it all together under all circumstances is the challenge. Reinholdsson’s team are still working on the electronic stability programme, for example, which has a lot of variables to juggle when things start to go sideways. Like an increasing number of cars, the V60 plug-in will offer a selection of contrasting driving modes, accessed via a simple row of buttons labelled Hybrid, Power and Pure. In the default Hybrid mode, the diesel engine and electric motor will attempt to work together to achieve the lowest possible consumption from moment to moment. With a fully charged battery, that means as much electric motor as possible, yielding a peak efficiency of 49g/km. And to those who scoff and point at belching power stations when electric-car CO2 scores are mentioned, the Swedes politely note that their own grid is largely nuclear or hydro-electric. So a low-carbon score really is low. In Hybrid mode the driver will also be able to hit an additional AWD button to keep both axles turning at all times, to cope with slippery conditions. Pure mode switches off the diesel engine to prioritise rear-wheel-drive, electric-only motion. When the battery charge falls below a set limit, the car will automatically switch back into Hybrid mode. The diesel engine will also kick in if you ask for too much acceleration or speed in Pure mode. The maximum electric-only speed will be 100km/h (62mph), while flat out in Hybrid mode will be capped at 200km/h (124mph). At anything beyond modest motorway speeds the diesel will actually be doing all the work – the electric motor ceases to drive the rear wheels beyond 120km/h (74mph). Finally, Power mode will harness all the electric and diesel horses together to make the V60 feel like it has a V8 under the bonnet. Zero to 100km/h (62mph) will take just 6.9 seconds. Not bad for a mid-sized estate that Volvo vaguely admits will weigh close to two tonnes (the non-hybrid V60 D5 AWD weighs 1690kg and the hybrid will be “considerably heavier” but under 2000kg). Sports suspension, fitted to lower the car in aid of reduced drag, will help to keep things the right way up. That impressive acceleration figure presumes a fullish battery, of course. If you’ve used it all up, significant urge from the rear will be absent and the stopwatch will need to tick through a few more seconds. There will be the option to prioritise the diesel engine during normal running, so as to save electric oomph for traffic-light grands prix or, more sensibly, to hold the battery back for urban motoring at the end of a longer journey. Charging a flat battery from the grid will take about 4.5 hours from a Swedish 10-amp socket, an unspecified lesser time in the UK. The on-board charger can cope with up to 16 amps at 240 volts. One of the reasons Volvo has hybridised the V60 rather than its larger V70 estate is that the two cars share the same underpinnings. The V60’s smaller, lighter body leaves more in reserve. “Because the platform also carries bigger cars, we can still have a good payload,” says Karl-Johan Ekman, business project leader for the car. Towing capability will remain the same as the ordinary D5 AWD, at 1800kg, he notes. There are compromises of course. The battery eats up luggage space, meaning the boot volume with seats up falls from the standard car’s 430 litres to just 310 litres – quite a small capacity for a Volvo estate. With the seats folded, the raised boot floor will no longer be flush with the seatbacks but will be 6cm higher. The other big compromise will be cost: Ekman says only that the V60 hybrid will be “quite high priced”, which seems unavoidable since the car requires a whole V60 D5 auto (rock bottom UK list price £29,420) plus about £5,000-worth of batteries in the boot. I’d guess at an on-the-road price of at least £40,000 (possibly £45,000, if the government’s plug-in incentive scheme is still in action when the car arrives). The other headline figure – 49g/km – comes paired with consumption of 1.9 litres per 100 km, or about 124mpg. Impressive numbers, but they’re currently targets rather than results measured on the official cycles. Engineering of the car is advanced but still ongoing, with Reinholdsson noting that gearing and shift points are still under development, for example. Will the team manage to achieve such difficult goals? Judging from the polished state of the parallel electric C30 project, I suspect Ekman will keep his job. 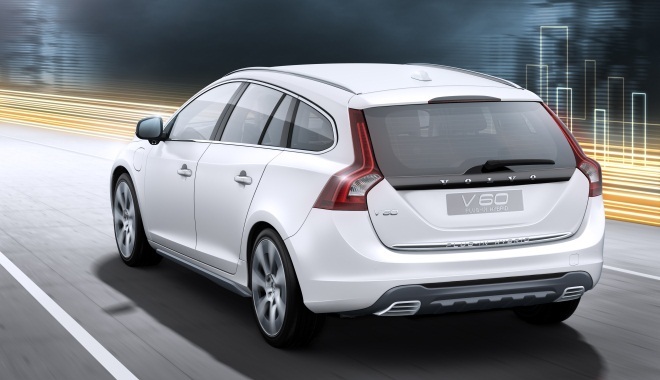 No doubt the V60 will arrive with targets intact at the tail end of 2012.